Gaucho (Spanish: [ˈɡautʃo]) or Gaúcho (Portuguese: [ɡaˈuʃu]) is the term commonly used for people who live in the south regions of Brazil, mainly in Rio Grande do Sul. It can also be used for people from Uruguay, Argentina and Chile. 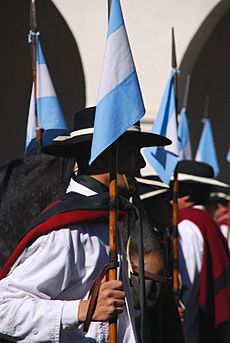 They are similar to the North American cowboys, and, like them, gauchos of Argentina have become a symbol of freedom. 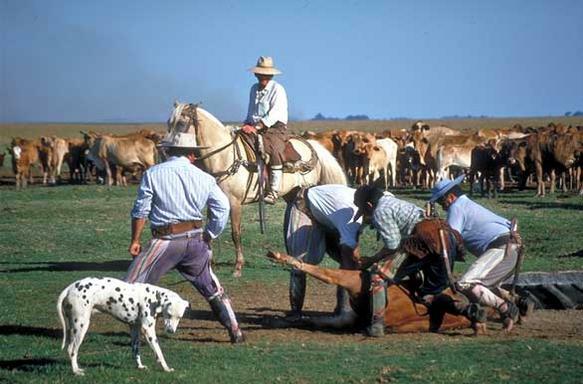 Working with his horse, a laço, boleodoros, and a knife, gauchos rode around the Pampas, killing wild cattle whose hides he sold secretly. They were usually outlaws, and did not become respectable until they fought with San Martin for Argentine freedom. 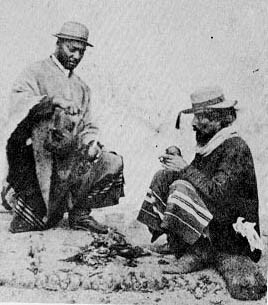 After some time, many gauchos began working for hacendados and spent their lives helping huge herds of cattle over the Pampas. They liked to choose where they worked and traveled from place to place. Like cowboys, gauchos had a traditional outfit: a big hat, a collared shirt (mainly red), and baggy pants called bombachas, which were tucked into leather boots. Colorful pieces of cloth or a wide leather belt decorated with silver went around his waist, and silver spurs were on his boots. When working, gauchos often wore a big leather apron. Today, though, most gauchos are disappearing. Trucks, roads, and fences are changing gauchos into farmers and helpers. Traditional dress is usually worn only on festival days, when they can remember their exciting old days. Gaucho in ring lancing contest, Buenos Aires Province. Gauchos drinking mate and playing the guitar in the Argentine Pampas. 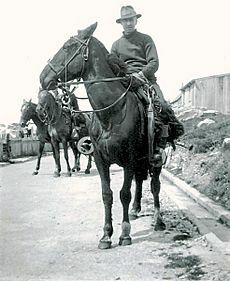 Segundo Ramírez, who inspired Ricardo Güiraldes to write Don Segundo Sombra. Gaucho Facts for Kids. Kiddle Encyclopedia.